The Bible is overflowing with scripture revealing Prophecy, but do you know it’s a guide for not only every day life but how to prepare and live in tribulation and persecution? A guide for surviving persecution awaits in every chapter. We have watched as Christian persecution has risen dramatically in the last 10 years, and came full circle to where it began, with Christ’s death and resurrection. We have watched a great falling away of whole bodies of Christ’s church, adopting doctrines of demons to justify sin. Whole bodies moving full speed ahead with new age teachings like everyone worships the same god, and there are hundreds of paths to heaven. There is no hell, and now some are even doing “destiny readings” to promote mysticism warned of in the bible. Blurring the lines of prophecy with fortune telling and in so doing diminish the power of the Holy Spirit in our lives. We have watched and warned as tribulation and judgement begins. But what are we to do?? Do we sit quietly and idlely by because it doesn’t concern us? No, we have to prepare. Scripture also tells us this and it gives a clear picture from the Prophets of old and the Apostles. God has from the beginning made provision for His people,yet some find it hard to have complete and total reliance on God. Faith opens the door for any one of us to know that with God all things are possible! When the Lord gave Moses the words of the covenant to deliver unto Israel he spoke of all the signs and miracles they saw in egypt and proved how God was more than capable to provide to provide for their needs. They were led through the wilderness for forty years as their clothes and shoes never wore out! (Deuteronomy 29:1-6). We too today must be willing to put our faith more in the unseen and rely on the Lord who is the same yesterday, today and forever. There is a very good lesson the Lord has taught found in Luke 12:22-34, on how we must never lose sight to not look to the world for our help, but to God! Early Christian writers and historians tell us John was boiled in oil, exiled to Patmos and God protected Him. John received the Revelation of Christ while exiled. Most look to the book of Revelation with fear and mystery, we look to Revelation as a guide to whats coming and how to survive, and how He will protect those who live and obey Him, those who emerge victorious through it all. In the first books of Revelation where Christ writes to the churches He gives a clear guide how to survive the coming tribulation. (Revelation 3:7-13, Revelation 3:2) Revelation 3 ends with this, possibly one of the most important things to remember. 21 To the one who is victorious, I will give the right to sit with me on my throne, just as I was victorious and sat down with my Father on his throne. 22 Whoever has ears, let them hear what the Spirit says to the churches.” John was the only Apostle that died a natural death keeping His Faith throughout all trials. The rest of the Apostles died as martyrs. Stephen was stoned to death and his last words were I see Christ at the right hand of the Father. God gave Him a glorious vision and deliverance. Peter went to the cross and refused to be crucified as Christ, so they hung Him upside down. But Christ was there through it all. Paul was stoned, imprisoned and finally beheaded before taken to Glory. He never gave up. Every day I pray as my spouse leaves for work, for protection. As I leave I pray for protection. We must all learn to do this, thanking God for His blessings and ask for divine guidance and protection. Not only in our daily lives and tasks but in the coming tribulation. We must prepare. We must do as the Prophets and Apostles did, and cry out to God. I pray daily for strength and courage that when it becomes my turn that my faith waiver not. We will all experience tribulation, and we have wonderful guides and examples to show Gods mighty hand of mercy. Our inheritance awaits us. One day soon, Christ will return with a fiery sword out of His mouth and those of us still alive will be gathered to Him from the corners of earth. We are commanded to watch and warn, not hide with the ungodly in caves. We are told not to fear, for He is with us, we are told not to value life or treasures on earth but to store up our treasure in Heaven. 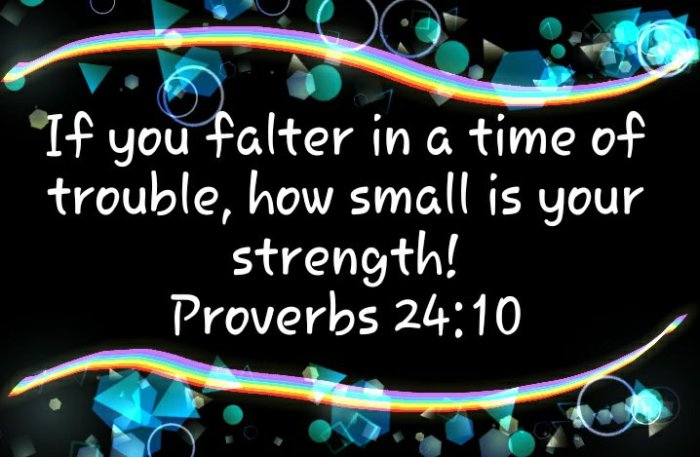 10 If you falter in a time of trouble, how small is your strength! 12 If you say, “But we knew nothing about this,” does not he who weighs the heart perceive it? 2 Wake up! Strengthen what remains and is about to die, for I have found your deeds unfinished in the sight of my God.